The second morning in Hong Kong we picked up our passports complete with our new Chinese Visas! The two page-sized stickers mark the 80th stamp on our passports, and that’s just from this trip! Our passports from our last trip were expired so they’re packed away somewhere. Looking at our passports now is looking back on nearly 16 months of extensive and exciting, fantastic and frustrating, amazing and astonishing TRAVEL. Pure TRAVEL. We’ve loved every minute of it and it’s not over yet. That tiny Chinese Visa sticker reminds us that there’s one more country, one more month and many more experiences still to be had before we change our lifestyle and begin our lives LIVING abroad. 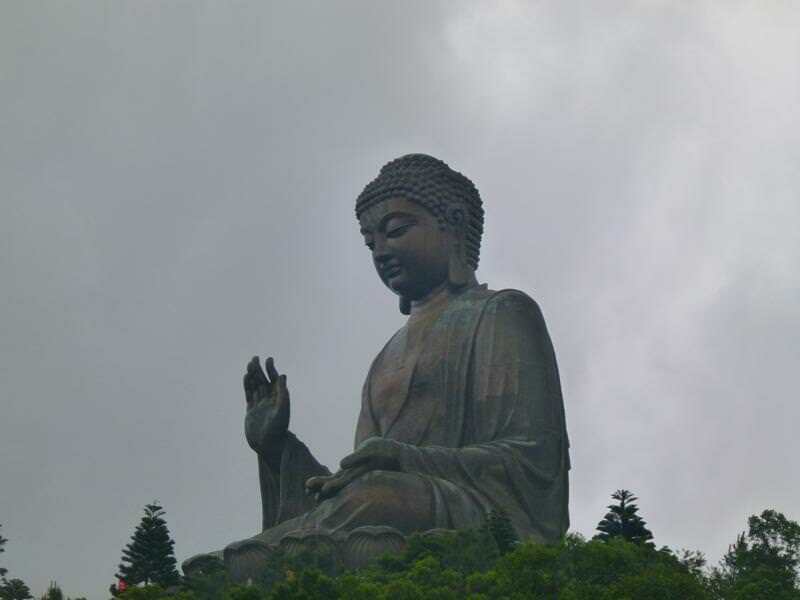 Before China we still had to finish up Hong Kong, so we decided to head over to Lantau Island to check out the world’s largest seated bronze Buddha. We’ve seen plenty of Buddhas in our day now, we’ve seen the tallest Buddha, the largest gold-plated Buddha, the largest reclining Buddha…. just about all the Buddha we can handle. We know Buddha so well that we have given him a nickname, we call him Boods. Probably a nickname that the monks wouldn’t approve of, but have they seen all the largest Buddhas and know him like us? Unlikely. We took the amazingly efficient metro line again, this time all the way to Lantau Island. When we arrived on the island, so did the bad weather. It seems to follow us lately but it stopped bothering us now. Without the cloud cover, walking around town would be too hot, so we appreciate the clouds as long as they don’t rain on us. Which is what they started doing when we got close to the big bronze Boods. 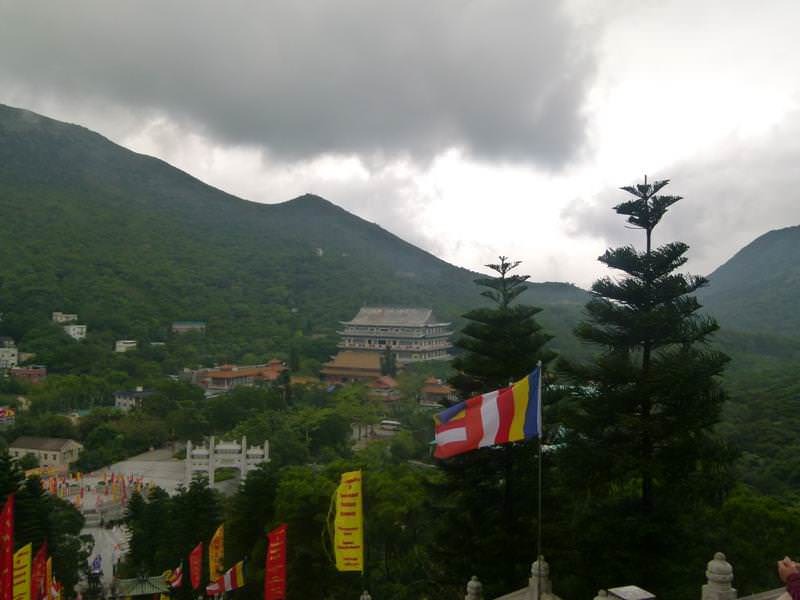 Luckily when we reached the top of the 100 or so stairs to reach Buddha, the clouds parted and the rain let up, just long enough for us to get a couple of photos. Even though we’ve seen a lot of Boods in our day, this one was still impressive. 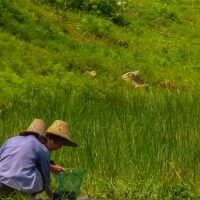 Seated atop a serene and peaceful hill overlooking a vast valley and a meticulously carved monastery, the only thing that took away from the experience was the Chinese tour groups. 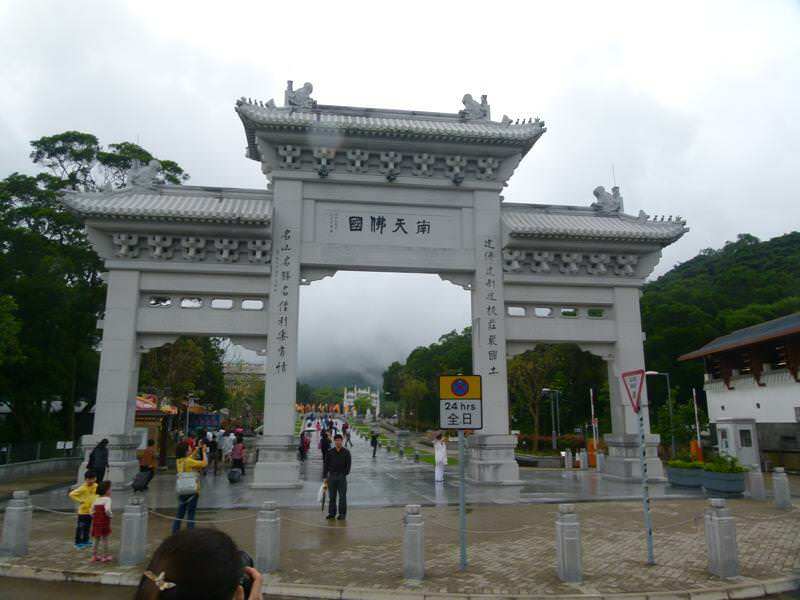 As we were leaving the big bronze Buddha, one of the tour guides saw us without a group and must have assumed we were lost and scared. She rushed over to us and exclaimed in a loud, comical accent that we needed to attend the Kung Fu Monk show. 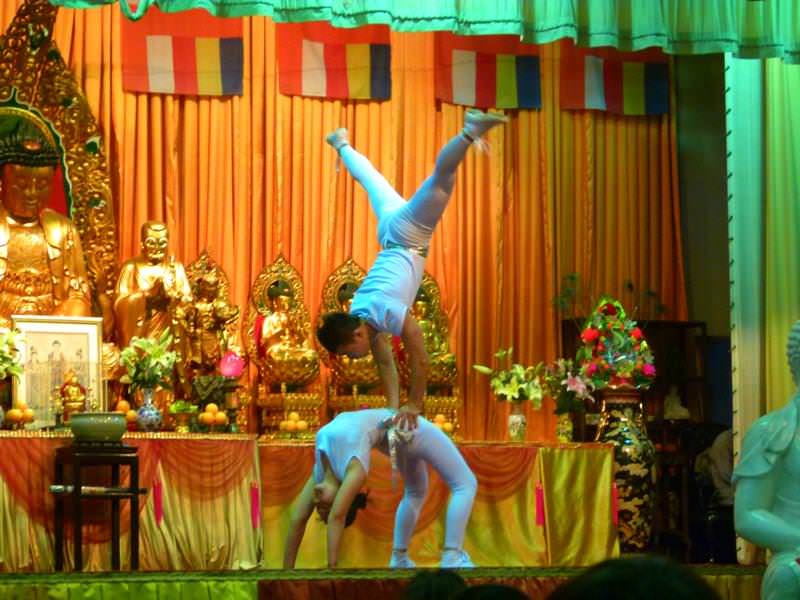 We learned that Buddha’s bones have been transported to Hong Kong for the first time in hundreds of years, so to celebrate the monastery put on a show of their techniques. We went in expecting some cheesy fake Kung Fu show but it ended up being spectacular! It was a mix between Cirque de Soleil and The Karate Kid. There were some amazing acrobatics, some weapons demonstrations and guys were breaking steel beams on their foreheads. Not at all the zen atmosphere one would expect when entering a Buddhist temple, but entertaining nonetheless. By the time the show was over, the rain returned and we rushed back to the bus and made our way back to Kowloon. By the time we got back to town it was dark and time to go see the light show. 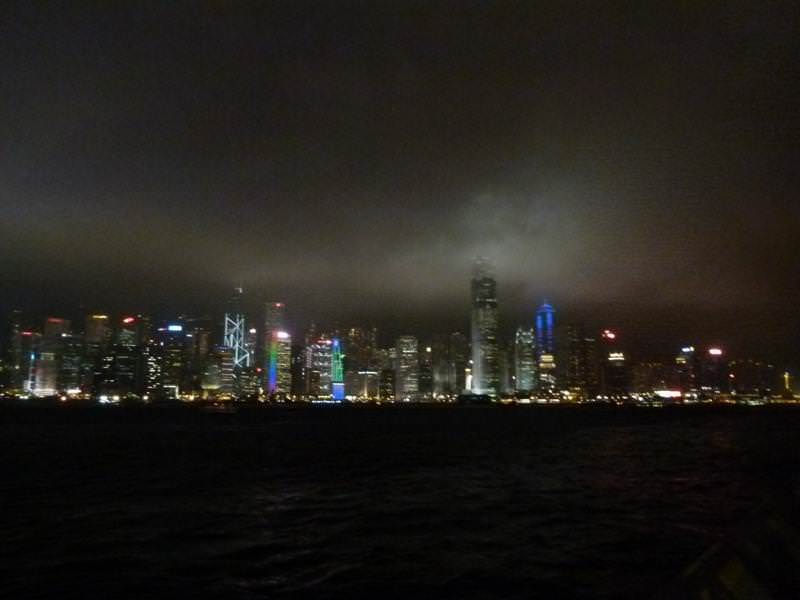 The south shores of Kowloon point across the Victoria Harbour towards the spectacular lights of the Hong Kong skyline. 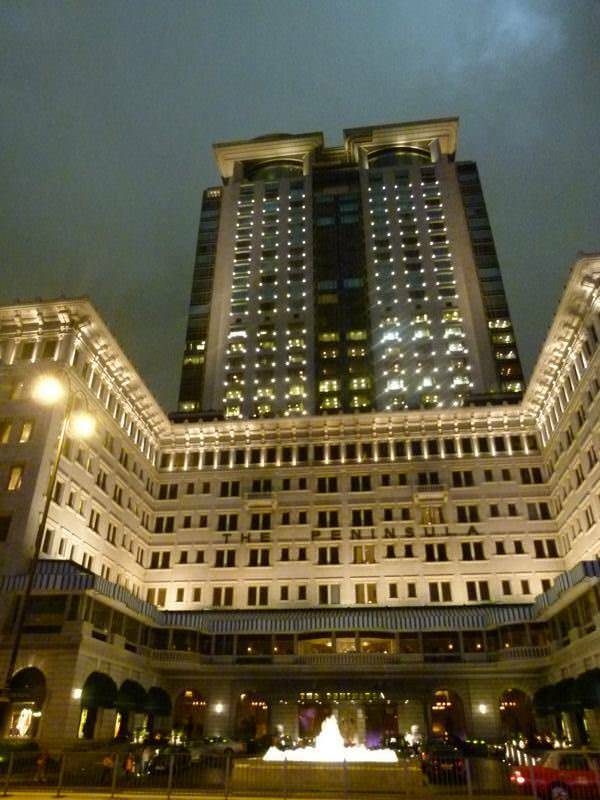 The regular lights on the buildings were enough to impress any cityscape lover, but the Hong Kongers like to step it up a notch with a bunch of colour changing LEDs. The show was accompanied by some distorted music which was belted out by an eccentric college student. The real draw to the place is its setting on the harbour and its long, cobblestoned “Avenue Of The Stars”, a Hong Kongers take on Hollywood’s version complete with Bruce Lee and Jackie Chan; although we couldn’t find their stars because their real names are nothing close to their American ones. All in all Hong Kong was great. We love cities and this was one of the biggest, cleanest, and organized cities we’ve been to. It has everything a person could need and more and its setting on the water gives all of its shores a dazzling quality that are unique to this urban archipelago. 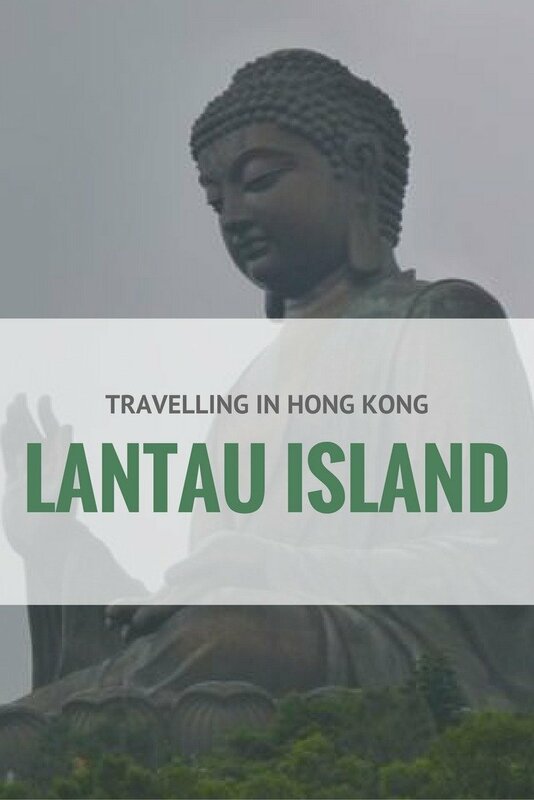 With so many islands we definitely only got a taste for Hong Kong, but with it being such a major Asian transport hub, I’m sure we’ll be back to see more. 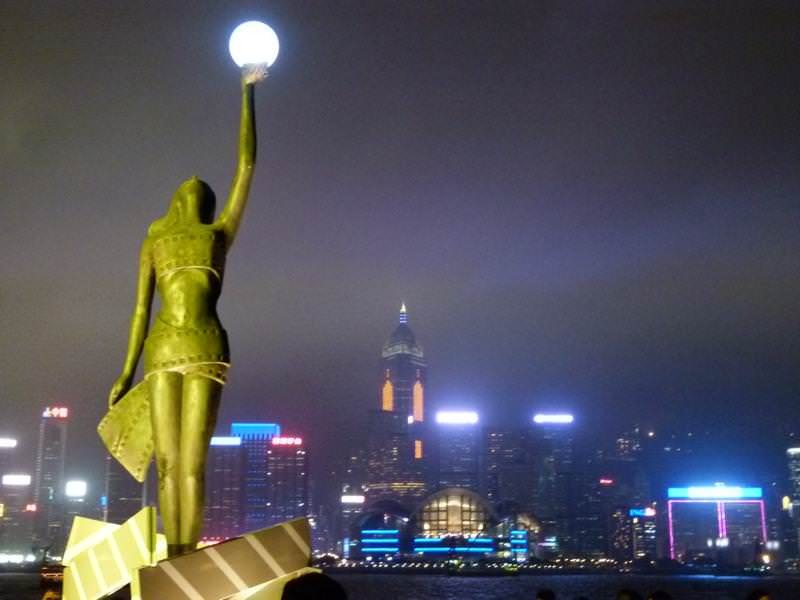 Hong Kong is one of the big cities I’ve been to and loved it. It’s such a amazing vibe and the scenery are beautiful. You’re right, it’s beautiful there. Such a great, modern city! Amazing big bronze Buddha statue! 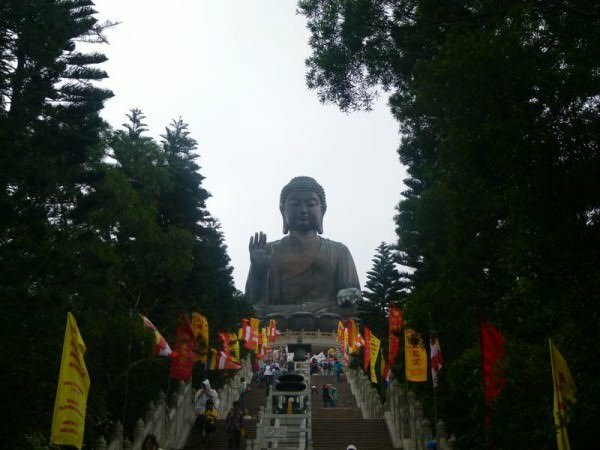 I almost had the chance to visit Nara in Japan a long time ago, but I missed the opportunity (it didn’t depend on me), but I guess Hong Kong is another place where I could find a large Buddha statue! 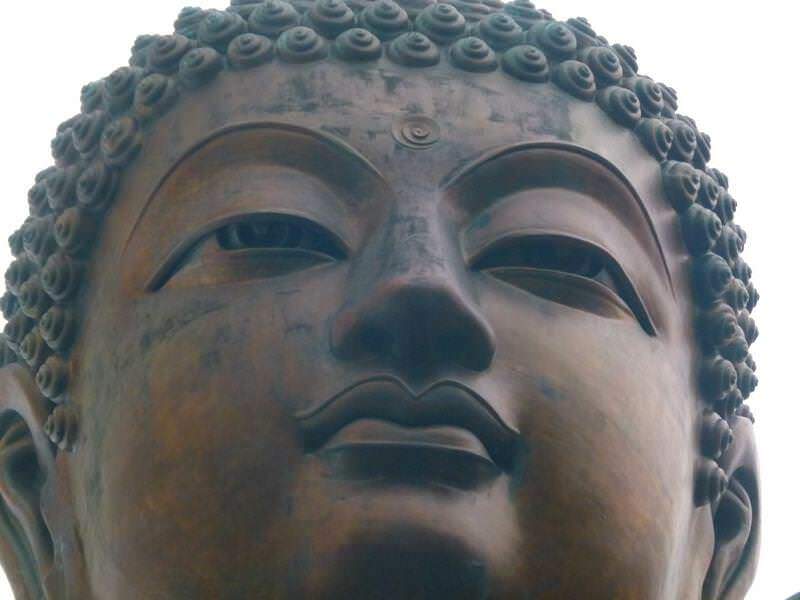 Yes, the seated Bronze Buddha in Hong Kong is amazing!